Established in 1986 and officially rated one of the top ten galleries in China, Wan Fung Art Gallery has a collection of over 13,000 masterpieces of Chinese fine art with a 10,000 sq-ft headquarters in Hong Kong and 7 galleries and 1 woodcarving museum branched in Beijing, Shanghai and Guangdong. Wan Fung discovers and promotes up-and-coming as well as established Chinese artists with unique styles and exquisite artistic skills. It is now one of the biggest investors and promoters of contemporary Chinese Art in the world. During these 20 years, Wan Fung has organized more than 700 art exhibitions in Hong Kong, China, Taiwan, Singapore, Malaysia, U.S. and Canada. It has published more than 100 art albums, among which, Twentieth Century Masterworks of Chinese Painting produced with six-year scrupulous preparation has earned high acclaim from all sectors of society. Committed to bringing about outstanding Chinese artists who possess unique style and prominent artistic skills, most of the artists that Wan Fung has promoted have become influential masters of different art schools in China. More than twenty artists are regularly on the list of selected lots in auction houses such as Sotheby and Christie. All these enable Wan Fung to enjoy the prestigious status as the leading group in the international market of Chinese fine art.In 2004, Wan Fung Art Gallery was rated one of the top ten art galleries in China by the Chinese Arts Organization. In 2005, it was awarded Honor of Integrity by the Chinese Central Government Culture Bureau, and selected in the Patriot Canon. Mr. Kwok Ho-mun, the founder of Wan Fung Art Gallery, is a famous artist, connoisseur as well as art critic in Hong Kong. He is ?? ?Friend of Chinese artists and is widely noted for his highly original insights for Chinese art. His biography has been extensively reported by the media from China and overseas. 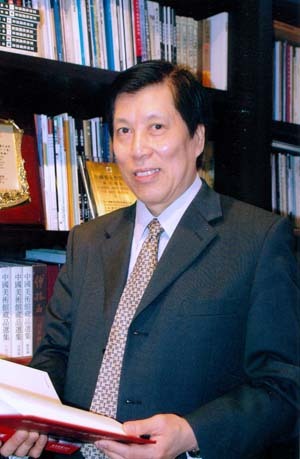 Director of HLY Holdings Limited, Founder and Director of Wan Fung Art Gallery, President of International Art Collectors Association, Honorary President of Shanghai Hong Kong Cultural Exchange Association, Member of the Global Foundation of Distinguished Chinese, and Honorary Doctor of Literature of The Queen's University of Brighton in the US. Being one of the most important and influential art dealers in today's China, Dr Kwok was born in Shanghai in 1947, with Guangdong as his ancestral home. Nurtured in a scholarly family, he was widely exposed to authentic masterworks of Chinese calligraphy and painting and indulged himself in painting and seal cutting in his childhood. He graduated from high school in 1966, when the Cultural Revolution just happened. He devoted to the theory and practice of Chinese Painting in addition to his studies of Chinese Literature, History and Philosophy. The turbulent era enabled him to better understand the meaning of life. In 1974, he migrated to Hong Kong, set up a studio to teach Chinese painting, and did various kinds of investment. In 1986, he established Wan Fung Art Gallery. The colossal long-term promotion campaigns began in the next year. Up till now, he has curated more than 700 quality exhibitions in Asia and published over 100 albums. In these 20 years, he has published a large number of critiques and market reviews in financial magazines and newspapers in Hong Kong, Beijing and Shanghai. In recent years, he was invited by Shanghai University of Finance and Economics and FudanUniversity to give lectures on Art Connoisseur and Art Investment to people in the banking and real estate industries. A total of over one hundred lectures have been held. They all earned international acclaim. Dr Kwok? 's contributions and achievements have been documented in Hong Kong and Macau Elite 1990, All Leaders 2004 and Today? 's Chinese 2008. In 2004, he was awarded the Patriot Honor. Dr Kwok is famed for his original insights for Chinese Art and his ingenious marketing strategies. He is also named Friend of Chinese Artists' for his considerable support to Chinese artists. His authored Collecting and Investing in Chinese Paintings is regarded as one of the most important reference books for art investment.